Honestly, I was hesitant to start the Lunar Chronicles. Cinder pleasantly surprised me but did not wow me either. 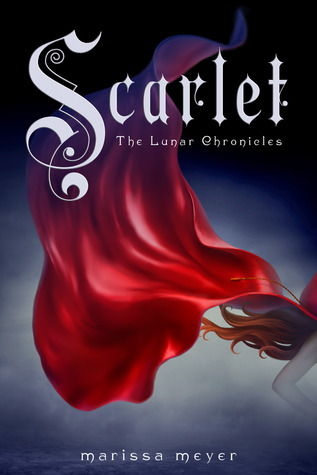 But I am glad that I continued the series because I really, really liked Scarlet. First of all I liked it more because of the new characters. From the beginning I really liked Scarlet. She felt like such a different kind of heroine than we usually see in YA. She is just a regular girl, but she is feisty, smart and has a bit of a temper. I think I kind of fell in love with her when she started angrily throwing tomatoes at the wall. Because let’s be honest: we all have moments where we want to start throwing tomatoes, but we rarely do it. But Scarlet does. She throws tomatoes, she stands up to a crowd to defend a stranger, she does her best to be strong when she’s falling apart and she would shoot someone to get to her grandmother. She wears all her emotions on her sleeve, the good and the bad, and I admire her greatly for it. Wolf really is a little cinnamon roll, even though he could easily kill you with just one hand. He was adorably awkward and I loved his storyline. I thought it would be a bit cliché but it wasn’t and I really enjoyed the development of the relationship between him and Scarlet. It was perfectly paced and felt real and I really appreciated that. But even though they are the main characters there is another new character that I immediately fell in love with: our dear Captain Thorne. The charming, cocky and egocentric thief is hilarious and the perfect partner in crime for our girl Cinder. Their “friendship” is worth gold. Talking about Cinder, both she and Kai also grew a lot on me in this book. I really liked that we had all the different POV’s, because it introduced me to new characters, but also made my appreciation for the older characters grow. While I was still feeling a little ‘meh’ about the Cinder-Kai romance in the first book, in Scarlet I really started rooting for them. I mean, the guy kept her foot. Her foot! If that’s not romantic, then what is? Another benefit of the multiple POV’s is that the world really expanded quite a bit. Other than New Beijing we also see Paris and we learn a whole lot about Cinder’s backstory, which is what I was really missing from book one. We also learn more about what Levana is planning and so the plot begins to thicken. Both storylines eventually do come together in a very natural way. We are starting to form a real squad and that is what excites me most of all. All these characters are pretty great in their own way, but put them together and it is just perfection (squad goals!). The ending is great in that the adventure is only still starting and I can’t wait to read all about it. “That’s him,” said Cinder, ignoring Thorne’s glare. I’m just got this book! absolutely felt in love with Cinder! Great Review!